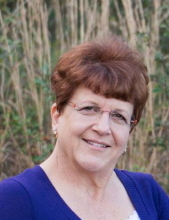 Judy Reiter—a loving wife, mother, and grandmother—entered heaven on March 30, 2019 surrounded by family. She left her husband of 46 years, Dale Reiter, to cherish her memories and celebrate her life. Together, Judy and Dale have four beautiful children with families of their own: Rachael Glaser, Leah Swisher and her husband Brant, Michael Reiter and his wife Stacey, and Anna Torres and her husband Alex. They also have four grandchildren: Matthew Glaser, Thomas Glaser, Reagan Reiter, and Carlyn Swisher. Judy’s favorite pastime was spending time and making memories with her family, particularly at Christmas. She decorated her home with a large, unique Santa collection and baked her family’s favorite cookies, leading to a freezer full of cookies that often lasted until July. Judy incorporated her love of sewing into the festivities by crafting handmade, custom stockings for each of her family members, a tradition her family intends to continue. When she wasn’t spending time with her family, Judy spent her time reading murder mysteries and thrillers. A memorial service will be held at 10:00 a.m. on Saturday, April 27, 2019 at the Reiter home. The family requests that donations be made in support of breast cancer research or to the Savannah Hospice House in lieu of sending flowers. King and Son's Funeral Home of Glennville, Ga. served the Reiter family. To send flowers or a remembrance gift to the family of Judith E. Reiter, please visit our Tribute Store. "Email Address" would like to share the life celebration of Judith E. Reiter. Click on the "link" to go to share a favorite memory or leave a condolence message for the family.